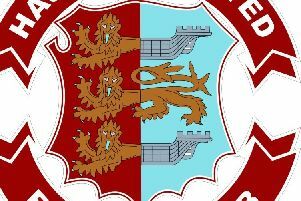 Hastings United Football Club’s academy team scored a dramatic last gasp winner in a top-of-the-table clash on Wednesday. A Jordan Harley goal deep into added time gave United a 2-1 victory at home to The National League U19 Alliance Division B leaders Maidstone United Ambers. The result moved second-placed United - who are still unbeaten in the league - within five points of their victims having played two fewer matches. United academy manager Dean White said: “The performance shown by whole group against Maidstone was exactly what I am looking for, irrelevant of the result. In front of a crowd in excess of 200, United led 1-0 at the break thanks to Tom Climpson’s header from a Charlie Ball free kick. Maidstone began the second half well and equalised with a header at a corner. The home side put that behind them and went on to search for the winner, which eventually came when Ollie Black’s long throw ping-ponged around in the area and ricocheted onto the crossbar before headed in by Harley from close range. It was a real team effort from United, who had trained on each of the two days prior to the match and arrived an hour early on matchday itself to run through their set-pieces. White added: “The lads deserve so much credit as they have bought into our culture of working hard, being organised, aggressive and difficult to beat, and they are now seeing the benefits of this. United: Stokes; Morton-Davage, Climpson, Harris, Black; Dullaway, Ball, Beale, Harley; Rodari, Smith. Subs: Kieran, Neech, Harffey, Jegorovs, Mepham. United’s next game is at home to Tonbridge Angels on Wednesday afternoon, kick-off 2pm.